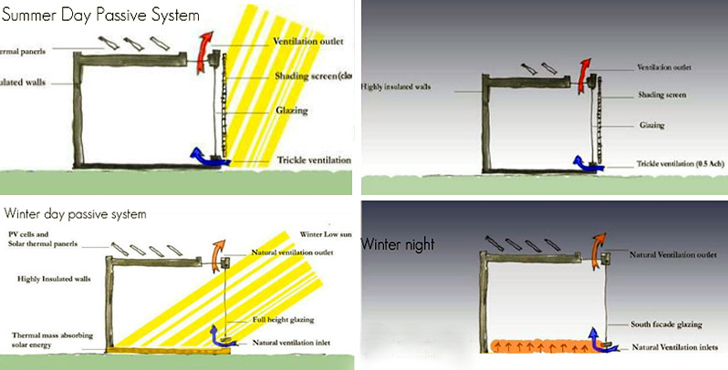 A team of architecture and engineering students have devised a way to harness <a href="https://inhabitat.com/parasol-modular/" target="_blank">Egypt</a>’s strong <a href="https://inhabitat.com/sun-cutter-markus-kayser-creates-brilliant-solar-powered-laser-cutter/" target="_blank">solar rays</a> and combine them with an innovative design. 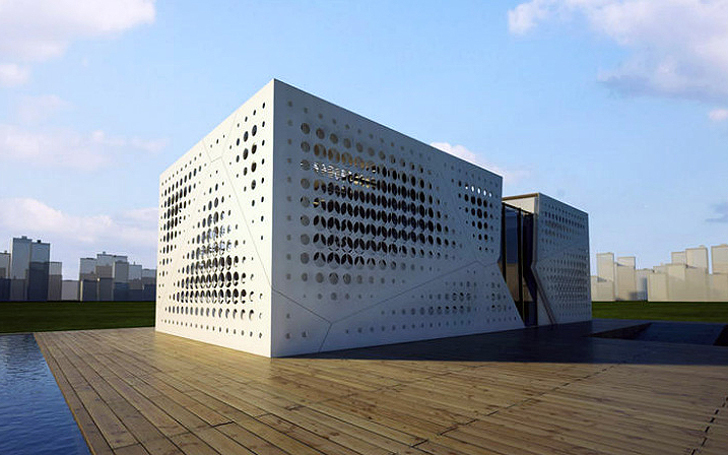 The SLIDES house -- which stands for sustainable, livable and interactive design -- is the <a href="http://www.aucegypt.edu/Pages/default.aspx" target="_blank">American University in Cairo</a>’s entry for 2012’s European Solar Decathlon. 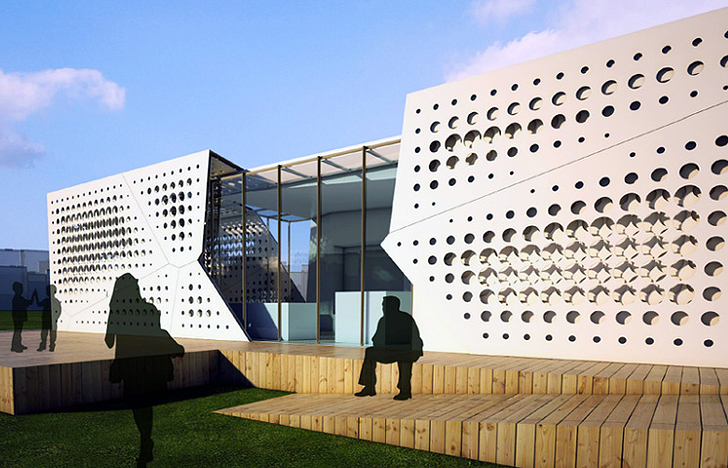 The home is designed to maximize solar power efficiency and sustainability. Since<a href="https://inhabitat.com/unrest-in-the-middle-east-causes-fluctuations-at-the-pump-senate-leaders-ask/" target="_blank"> Egypt</a> is a country known for not only its hot sun, but its long tradition of architecture, the students wanted to design a modernized home that echoed architecture traditions of the past. 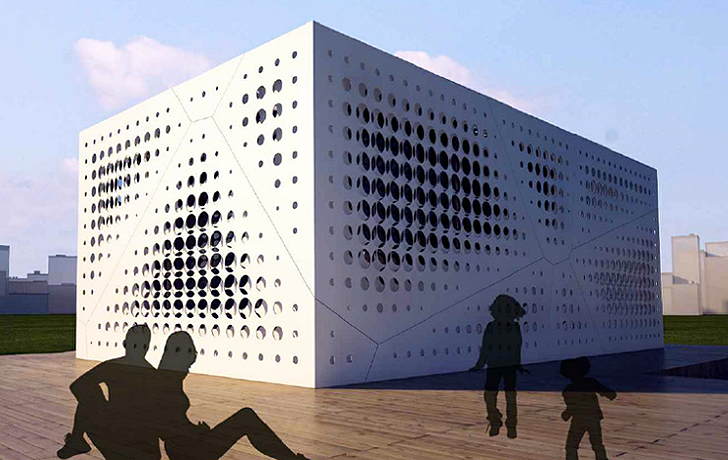 The students compare the structural design to a matchbox, with a double-layered façade of interlocking <a href="https://inhabitat.com/the-palms-houses-futuristic-metal-screens-provide-privacy-from-in-laws/" target="_blank">perforated pieces</a>, cast in a sand hue with yellow infusions. When closed, the home maintains a passive cooling system. Since temperatures reach well into the 100s in summer months in<a href="https://inhabitat.com/incredible-garbage-city-rises-outside-of-cairo/" target="_blank"> Cairo</a>, a ceiling vent helps hot air escape. 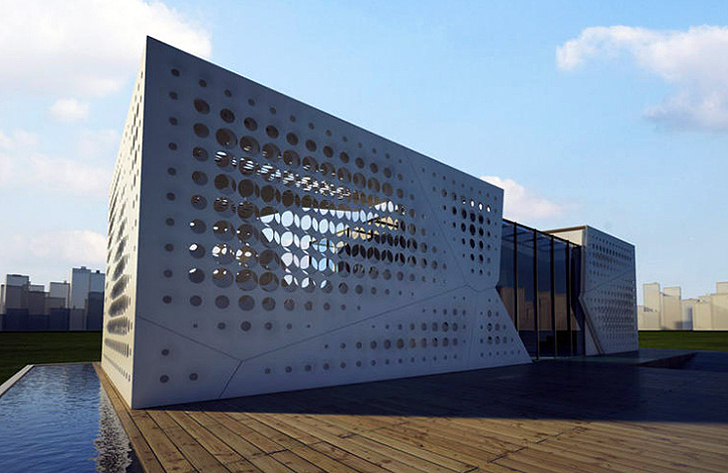 In winter, the second <a href="https://inhabitat.com/amazing-jovanovic-residence-built-on-the-slopes-of-the-la-hills/" target="_blank">screen</a> of the building’s skin is opened to absorb heat, which is stored in thermal mass flooring. 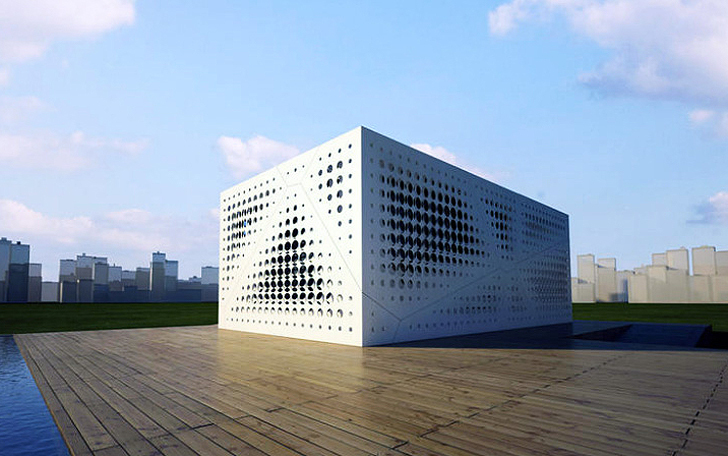 SLIDES is entirely powered by the sun, with a roof clad in <a href="https://inhabitat.com/redneck-shipping-container-house-comes-complete-with-solar-panels-camo-decor/" target="_blank">solar thermal panels</a> and photovoltaic cells. Combined, it becomes a net-zero energy structure, providing enough power to maintain a much needed cooling system for the desert area. Water shortage is also common to the area, so a <a href="https://inhabitat.com/defunct-dutch-sewage-plant-converted-into-fresh-green-apartments/" target="_blank">grey water</a> filter recycles water for drop irrigation and toilets. Amazingly, the students even developed a recycled material that the building has been constructed of. <a href="https://inhabitat.com/portland-oregon-is-the-latest-city-to-ban-plastic-bags/" target="_blank">Plastic bags</a> and wood waste are mixed together to create a fiber reinforced polymer that is molded into the perforated screens. 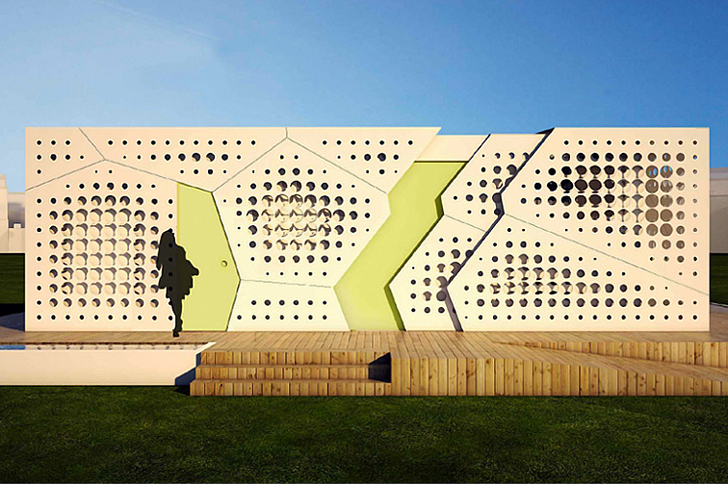 Should SLIDES be approved at next June’s Solar Decathlon Europe, it will cost a cool $1.1 Million to bring the home into fruition.